The story below was recalled by Congolese refugees Belle* and Marie. * The details described are accurate to the best of their recollection. Imagine surviving violent civil unrest only to discover that your sister is missing. Imagine your search for her yields only evidence that she has perished in her attempt to escape. Imagine drawing strength from your one remaining sibling as you arrange for her funeral and perform a traditional burial ceremony in her honor. And imagine learning more than a decade later that the sister whose funeral you arranged is alive and well in the United States. This is the story of Belle and Marie, two sisters currently living in Kakuma Refugee Camp in Kenya. In 2003, the women were separated from their sister, Julienne, when war broke out in their home country of the Democratic Republic of Congo (DRC). Eleven years later, after rumors convinced them Julienne was dead, the sisters were reconnected over the REFUNITE mobile platform. Belle and Marie lost contact with Julienne after civil unrest in Goma spiraled into violence in other regions of the country, and civilians began to flee. Julienne, who was in Kalemie when the war broke out, was forced to leave her husband and her siblings in search of safety. After Julienne’s disappearance, Belle recalls questioning people in the community who might have knowledge of her sister’s intended destination. She soon heard a rumor that Julienne had fled to Zambia. A year before Julienne vanished, Belle’s son had disappeared during internal turmoil in DRC. Belle pressed on to find information about her sister, desperate not to lose a second family member to the conflicts plaguing her country. Eventually she received a secondhand report that crushed her hopes: Julienne was thought to be among many escapees who had drowned while attempting to cross Lake Tanganyika. In 2005, Belle recalls making the painful decision to “remove my sister [from] my mind.” She arranged for a funeral to honor Julienne’s memory. Despite the absence of a body, Julienne received a traditional burial that year, and Belle and Marie began to move forward without their beloved sister. Belle’s struggles were far from over. With Julienne buried, she and Marie continued to live in a village called Lulilmba in the South Kivu region of DRC. Amid sporadic violence in the country, Belle suffered another loss in 2011, when her husband was caught in the middle of a rebel uprising and forced to flee the country. Unsure of his whereabouts and unable to contact him, Belle had lost a third family member in the chaos and violence of DRC instability. By 2013, Belle had seen her country rent apart by rebel violence. She had lost touch with her husband, and she had buried her sister. When violence broke out once again, Belle and Marie fled to Kenya, where they arrived at Kakuma Refugee Camp. Unbeknownst to Belle, her arrival at the camp would mark the moment in which her scattered family began to draw together again. She was about to encounter a mobile application that could harness the reach of mobile technology to reconnect her to her missing loved ones. Though she did not know it when she escaped to Kakuma, Belle’s husband, Herman, who had made his way through Tanzania to Kenya, was living in the same camp. With the help of Refugees United partner Kenya Red Cross Society, both Belle and Herman were registered on the platform. In November 2013, Belle received a text message from Herman. Assisted by an outreach volunteer, Belle asked him to confirm his tribe and country of origin, to verify that the text message sender was her husband. He answered all her questions accurately. She says it was “like a dream” to hear from him again. Though they resided in separate parts of the camp, Belle and Herman saw each other again for the first time in 2014. It was a moment of profound joy for Belle, as she reclaimed a small part of all she had lost in the violence. She could little have imagined then that it was a harbinger of greater things to come. Despite the goodbye the sisters had bid Julienne at her burial, Marie held to a sliver of hope – she had heard a rumor from a neighbor that, rather than drowning in her attempt to escape as Marie and Belle believed, Julienne had fled to Tanzania and might still be alive. In fact, Julienne had successfully escaped and was living in Syracuse, New York with her children. She was also registered on the Refugees United platform, and one day she found her sister’s profile. Belle and Marie contacted the outreach volunteers and the Kenya Red Cross Society. Together, the two sisters and the staff gathered to read Julienne’s message. She said she was looking for her two sisters, Marie and Belle. 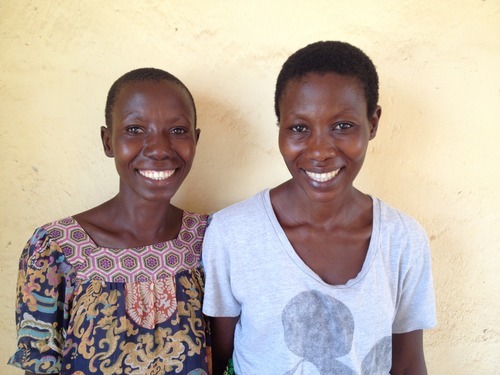 With help from the volunteers, Marie and Belle asked for verification – the name of Julienne’s father, her mother, and her tribe. Sitting together in their Kakuma home and recounting the moment they knew they had found Julienne, both Belle and Marie light up with pleasure. Belle tells the story with a wavering but joyful voice that betrays the deep emotions that still linger close to the surface. She explains that Kenya Red Cross Society arranged to call Julienne, who was living in the United States. For the first time in eleven years, the sisters were able to hear each other speak. She learned that Julienne had fled to Zambia and then Malawi, where she and her children were resettled to the US. “One day, God willing, I will see my sister again,” Belle says. The reconnection with Julienne has inspired inspired Belle to find her long-lost son, from whom she has not heard since 2002. The above interview took place on April 1, 2014 in Kakuma Refugee Camp in Kenya. It was conducted in English by REFUNITE employee Ida Jeng, with responses translated from French by a Kenya Red Cross Society volunteer. Above: A photo of Belle (right) and Marie (left), who reconnected with their sister Julienne after eleven years of separation using the REFUNITE platform. Belle also used the platform to find her husband, Herman, after three years of separation.